Bronze casting done of Nezahualcoyotl by Jesús Fructuoso Contreras in the Garden of the Triple Alliance located in the historic center of Mexico City. Nezahualcoyotl (Classical Nahuatl: Nezahualcoyōtl [nesawalˈkojoːtɬ], modern Nahuatl pronunciation (help·info)), meaning "Coyote in fast" or "Coyote who fasts") (April 28, 1402 – June 4, 1472) was a philosopher, warrior, architect, poet and ruler (tlatoani) of the city-state of Texcoco in pre-Columbian era Mexico. Unlike other high-profile Mexican figures from the century preceding Spanish conquest of the Aztec Empire, Nezahualcoyotl was not Mexica; his people were the Acolhua, another Nahuan people settled in the eastern part of the Valley of Mexico, settling on the eastern side of Lake Texcoco. He is best remembered for his poetry, but according to accounts by his descendants and biographers, Fernando de Alva Cortés Ixtlilxóchitl and Juan Bautista Pomar, he had an experience of an "Unknown, Unknowable Lord of Everywhere" to whom he built an entirely empty temple in which no blood sacrifices of any kind were allowed — not even those of animals. However, he allowed human sacrifices to continue in his other temples. Born as Acolmiztli Nezahualcoyotl ("Lion's Arm", "Hungry [or Fasted] Coyote"), he was the son of Ixtlilxochitl I and Matlalcihuatzin, the daughter of Huitzilihuitl. Though born heir to a throne, his youth was not marked by princely luxury. His father had set Texcoco against the powerful city of Azcapotzalco, ruled by the Tepanec. In 1418, when the young prince was fifteen, his father was assassinated. The Tepanecs of Azcapotzalco, led by Tezozomoc, conquered Texcoco and Nezahualcoyotl had to flee into exile in Huexotzinco, returning to stay in Tenochtitlan in 1422. His aunts bribed the Tepanec king and allowed for him to be partially educated as a Mexica. His exposure to Mexica culture and politics would influence how he later governed Texcoco. After Tezozomoc's son Maxtla became ruler of Azcapotzalco, Nezahualcoyotl returned to Texcoco, but had to go into exile a second time when he learned that Maxtla plotted against his life. Nezahualcoyotl as depicted in the 16th century Codex Ixtlilxochitl. As the tlatoani Itzcoatl of Tenochtitlan requested help from the Huexotzincans against the Tepanecs, Nezahualcoyotl envisioned a single military force in order to fight the mighty kingdom of Atzcapotzalco. After being offered support from insurgents inside Acolhuacan and rebel Tepanecs from Coyohuacan, Nezahualcoyotl joined the war. He called for a coalition consisting of many of the most important pre-Hispanic cities of the time: Tenochtitlan, Tlacopan, Tlatelolco, Huexotzingo, Tlaxcala and Chalco. The war was declared a shared and single effort, and the coalition army of more than 100,000 men under the command of Nezahualcoyotl and other important tlatoque headed towards Atzcapotzalco from the city of Calpulalpan. This began the military offensive that would reconquer Acolhuacan, capital city of the kingdom of Texcoco, in 1428. The campaign was divided into three parts. One army attacked Acolman to the north and the second Coatlinchan to the south. 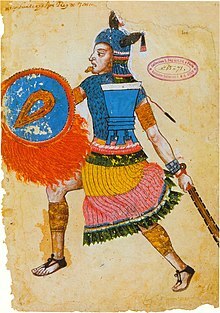 A contingent led by Nezahualcoyotl himself was intended to attack Acolhuacan, only after providing support, upon request, to the first two armies. The coalition conquered Acolman and Otumba, sacking them only due to the sudden Tepanec siege of Tenochtitlan and Tlatelolco. In a tactical move, the three armies united again and then divided into two. One of them, under Nezahualcoyotl, headed towards Texcoco laying siege to Acolhuacan on its way, while the other attacked and destroyed Atzcapotzalco. At the time the armies met again, Nezahualcoyotl reclaimed Texcoco and decided to conquer Acolhuacan, entering from the north while the Tenochca and Tlacopan allies coming from Azcapotzalco attacked from the south. The two armies simultaneously attacked Acolhuacan from two directions until they controlled the city's main square. After their victory, the coalition began a series of attacks to isolated Tepanec posts throughout the territory of Texcoco. The defeat of the Tepanecs and the total destruction of the kingdom of Azcapotzalco gave rise to the Aztec Triple Alliance between Texcoco, Tenochtitlan and Tlacopan. Nezahualcoyotl, the wisest ruler that had ever ruled over Anahuac Valley - as it was known at that time - was finally crowned Tlatoani of Texcoco in 1431. According to Motolina, Nezahualcoyotl practiced his strict laws judiciously and imposed them on all his subjects. He killed four of his sons for their sexual relationships with his concubines. Conquered cities paid tribute that was distributed among three kings. Fourteen cities were under Nezahualcoyotl, including Otompan, Huexotla, Coatlichan, Chimalhuacan, Tepetlaoztoc, Chiauhtla, Tezoyucan, Teotihuacan, Acolman, Tepechpan, Chiconauhlt, Xicotepec, Cuauhchinanco, and Tulantzino. Nezahualcoyotl adopted the Mexica legal system into his empire to help in the reconstruction of his city. There were eighty laws that he enacted; among them were laws about crime and punishment including treason, robbery, adultery, homicide, homosexuality, alcohol abuse, misuse of inheritances, and military misconduct. For example, in the case for adultery, there were different punishments according to the levels of adultery and the status of those involved. Adulterers were stoned, burned, or hanged if they had committed murder because of their extramarital affair. The Mapa Quinatzin depicts the hanging of a robber for stealing or breaking into a house. In cases of military misconduct, for example those soldiers who did not follow orders or killed captives, the condemned were hanged or beheaded. Nobles, too, were not immune to such punishments. Sons who stole from their father’s property were suffocated. Drunkards, incestuous men and women, and homosexuals were hanged as well. The friars that documented his life thought he was a pious man, though he was skeptical towards the indigenous gods that required human sacrifices. He practiced his faith in a peaceful way; in lieu of human sacrifice, he offered incense and fasted. He built a temple and prohibited human sacrifice in his city after he had fasted and prayed for the victory Texcoco had over Chalca. He allowed human sacrifices to continue in his other temples. He also tried to convert neighboring cities to his faith, most especially Tenochtitlan. He gathered priests from Tenochtitlan which he used to aid in reconstructing the religious system in Texcoco. He restored the existing gods and temples but also reformed and modified the existing ones. He placed a greater importance on the Mexica god and built a large temple dedicated to Huitzilopochtli. Revered as a sage and poet-king, Nezahualcoyotl gathered a group of followers called the tlamatini, generally translated as "wise men". These men were philosophers, artists, musicians and sculptors who pursued their art in the court of Texcoco. Nezahualcoyotl is credited with cultivating what came to be known as Texcoco's Golden Age, which brought the rule of law, scholarship and artistry to the city and set high standards that influenced surrounding cultures. Nezahualcoyotl designed a code of law based on the division of power, which created the councils of finance, war, justice and culture (the last actually called the "Council of Music"). Under his rule Texcoco flourished as the intellectual center of the Triple Alliance and was home to an extensive library that, tragically, did not survive the Spanish conquest. He also established an academy of music and welcomed worthy entrants from all regions of Mesoamerica. Texcoco has been called "the Athens of the Western World"—to quote the historian Lorenzo Boturini Bernaducci. Indeed, the remains of hilltop gardens, sculptures and a massive aqueduct system show the impressive engineering skills and aesthetic appreciation of his reign. Many believe, however, that of all the creative intellects nurtured by this Texcocan "Athens," by far the greatest belonged to the king himself. He is considered one of the great designers and architects of the pre-Hispanic era. He is said to have personally designed the "albarrada de Nezahualcoyotl" ("dike of Nezahualcoyotl") to separate the fresh and brackish waters of Lake Texcoco, a system that was still in use over a century after his death. Mexican banknote with portray of Nezahualcoyotl. The date of Nezahualcoyotl's death is recorded as being June 4, 1472, survived by many concubines and an estimated 110 children. He was succeeded by his son Nezahualpilli as tlatoani of Texcoco. His great-grandson Juan Bautista Pomar is credited with the compilations of a collection of Nahuatl poems. Romances de los señores de la Nueva España, and with a chronicle of the history of the Aztecs. The freshwater fish Xiphophorus nezahualcoyotl is named after Nezahualcoyotl. Nezahualcoyotl appears on the current 100 peso banknote of Mexico. One of his poems appears in tiny print on the face of the 100 peso note. Amo el canto del zenzontle :Pájaro de cuatrocientas voces, Amo el color del jade :Y el enervante perfume de las flores, Pero más amo a mi hermano, el hombre. But more than all I love my brother, man. ^ Martínez, José (1972). Nezahualcoyotl, Vida y Obra. México: Fondo de Cultura Económica. p. 11. ISBN 968-16-0509-8. Leon-Portilla, Miguel; Fifteen Poets of the Aztec World University of Oklahoma Press, October 2000. Prescott, William; The History of the Conquest of Mexico, Book 1, Chapter 6. Lee, Jongsoo; "A reinterpretation of Nahuatl poetics: Rejecting the image of Nezahualcoyotl as a peaceful poet" in Colonial Latin American Review, December 2003, Vol. 12 Issue 2, p 233-249. "Netzahualcoyotl" . Appletons' Cyclopædia of American Biography. 1900.